Texas Sailing offers several membership options to fit your sailing dreams. "Guest Membership" - Great for the occasional sailor. Our guest memberships are typically sailors who sail less than once per quarter with Texas Sailing. Guests can charter any boats available to non-members, and like our members, know they will be boarding and sailing a boat that is clean and in good repair. Guests and members don't have to worry about fueling, or pumping out the head (unless charter is longer than a weekend). Additionally, boats won't be available to guests when our office is closed (Mondays and Tuesdays). Our "Club Membership" is geared towards sailors who love to sail, but don't want to own a boat. Given their hectic lives, most "Club" level members find time to sail about every other month (about 5-6 times per year). At this level of participation, "Club Membership" begins to make financial sense with the discounts we offer on charters, etc. With our "Club Membership" we offer 25% discount on charters during spring, summer and fall and 50% from November till March. Members receive substantial discounts on training, seminars, clinics and Texas Sailing flotillas. Additionally, members have access to our online booking system to book a vessel anytime of the day or week. Club Membership is $40 per month, with a one-time set-up fee. Our "Advantage Membership" is a fantastic option for sailors who are available and like to sail in non-peak periods, typically Monday through Friday. The program offers sailors a fixed monthly payment to enjoy sailing on a select range of boats. Retirees on fixed budget love this program, as do younger sailors managing on tight budgets. Depending on your fixed monthly payment, we allocate a set number of "credits" to be used for the year. For example, $150 per month over 12 half-day sails during the week. Sailing during peak weekend periods uses more credits. Plus, you can enjoy 10% discount on sail training, seminars, and clinics. Advantage Memberships start at $95 per month, with a one-time set-up fee. Our "Premier Membership" is for active sailors who don't want to own a boat. "Premier Members" use our online booking system to reserve up to 15 sailing days per quarter (60 days per year). Plus, if the boat isn't booked that day, they can check-out the boat without using any of their 15 day per quarter quotas. We limit up to 3 "leasees" per boat and help guide you to a boat that is generally available when you would wish to go sailing. Your monthly payment is typically in the range of a slip fee to the equivalent of a monthly loan payment for that vessel. "Premier Members" love the known fixed monthly costs, not having to worry about additional slip fees, insurance costs, maintenance costs, etc. Call our office to discuss, as rates are based upon the chosen sailboat. Most sailors grow up dreaming of owning and sailing their own boat. Our charter management, allows sailors to own a fantastic boat while deferring a majority of the costs of ownership. Texas Sailing has been managing "charter boats" for decades and can help you access if this is the right option for you. Owners of our fleet boats love the professional maintenance and service their boat receive, arriving to their boats clean, fueled, and not having to worry about pumping out the head. Financially, they love their hobby is a legitimate business expense with taxable benefits. 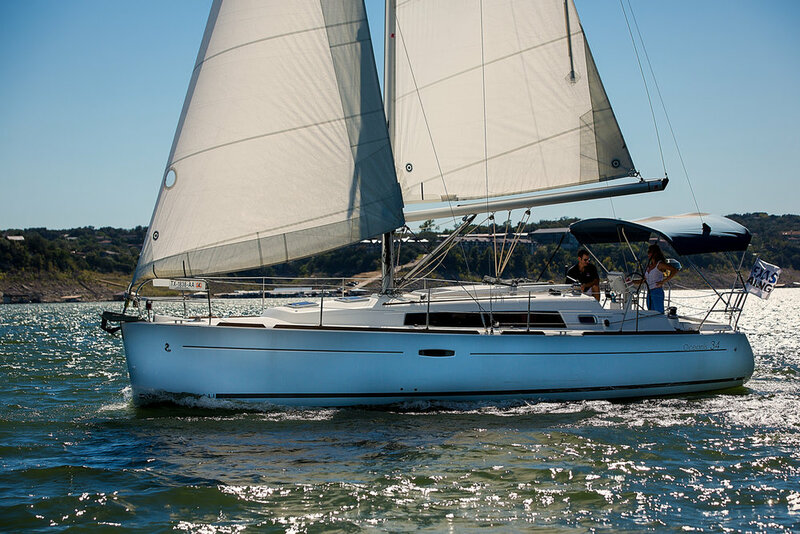 Call our office to discuss our "Charter Fleet Ownership Advantages"
Our "Associate Owners" own their sailboats and enjoy using their boats in Texas Sailing Club programs and events. This includes our popular "Beer Can Race Series" and other social sailing events such as Lake Travis Destination Sails & Raft-Ups, Exotic Flotillas all over the world. The program is ideal for those loving the sailing community of friends, and occasional fun competitive events. Call our office to discuss our "Associate Owners Membership"
Please call Texas Sailing to learn how you can become a member and begin receiving benefits today!